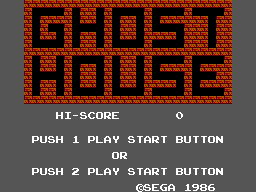 Ghost House (ゴーストハウス) is a platform action game developed and published by Sega for the Sega Master System. It was released as a Sega Card game worldwide, and later on a cartridge in Europe. It is based on the 1982 Sega G80 arcade game Monster Bash. Main article: Ghost House/Magazine articles.